October 25, 2016 October 26, 2016 BrownComments are off for this post. The newsprint nostalgia will never end. Those of us who have been fighting for digital transformation since the silly “blogs can’t possibly ever be journalism!” days feel like it is Groundhog Day. It is 2016, and Twitter is abuzz wondering if the newspaper industry made a “colossal mistake” in adopting a digital-first strategy, thanks to a recent Politico Magazine piece by Jack Shafer. Shafer cites an academic study from H. Iris Chyi and Ori Tenenboim of the University of Texas that argues that digital news is an inferior good that has largely failed to sustain newspaper businesses. If they just would have stuck with print, newspapers would have been far better off than they are today. Chyi and Tenenboim are exemplary researchers whom we admire, and we don’t think their study is flawed in its methodology. We are also frankly thrilled that Shafer took a look at some academic research on journalism, which happens all too rarely. Chyi and Tenenboim quantify in rigorous detail the travails of the industry, and the numbers demonstrating decline are not in dispute. But our research on newspapers offers broader context that, in our view, leads to different conclusions from this data. In a nutshell, the problem wasn’t the strategy. It was the execution. Chyi and Tenenboim seem quite convinced that a “digital first” strategy was in fact embraced at newspapers. They describe “all the efforts to make digital work” and “the industry’s focus on digital,” and that’s understandable given that is certainly the rhetoric one hears in trade publications and other public pronouncements. But if you have spent time inside newsrooms conducting extensive, long-term ethnographic research, as we have, you know that the reality hasn’t met the rhetoric — especially during earlier days of digital, when the opportunity was ripe. Well, I used to work for a company called Digital First Media and at a newspaper-industry think tank, and I’ve visited more than 100 newsrooms and spoken at more than 100 newspaper-industry conferences and seminars, and I can flatly say that the industry never, ever adopted anything close to a digital-first strategy. The colossal mistake that the newspaper industry made was responding to digital challenges and opportunities with defensive measures intended to protect newspapers, and timid experiments with posting print-first content online, rather than truly exploring and pursuing digital possibilities. Exactly. And there is plenty of academic research to back him up on this point. We have spent the past 11 years studying the factors that inhibit newsroom change (after years of working in the industry ourselves). As researchers, we’ve conducted about 200 interviews and spent weeks and in some cases even months in newsrooms like the Milwaukee Journal Sentinel and The Christian Science Monitor, where we’ve returned each year for the past seven years to keep tabs on its ongoing transition away from its daily print edition. Brown also spent 2002-2005 working at the Committee of Concerned Journalists, surveying and visiting newsrooms all over the country on how their daily work matched up with their core values. We consistently found a huge gap between what newsroom leaders said and what they actually rewarded and praised in the daily operation. And it is primarily culture and embedded assumptions about the right way to do things that inhibited most newsrooms from making meaningful change. One newsroom we studied required all of its reporters to blog, but provided no guidance on how those writers were supposed to incorporate those new routines into the daily workflow. Some reporters were chided for breaking news in their blogs instead of the legacy print product — where, they were consistently reminded, the bulk of the revenue came from. We found that innovation often occurred in isolated pockets of the newsroom, outside of the usual rhythms of the print edition, in places such as the sports sections and photography departments. But without potential for substantive revenue, those experiments drifted without support from above. In the early days, online often worked on its own, and the lessons typically did not filter throughout the larger news operation because, in practice, it was not valued or prioritized by the organization. Traditional journalists who did not want to adapt to new routines often resisted the changes; many felt the immediacy and brevity of the digital medium threatened bedrock journalistic values focused on investigation and verification, even though recent developments have shown how they can enhance those values. We interviewed people concerned about holding big stories for next morning’s paper. Daily production cycles revolved around print deadlines, and in many cases, still do. Perhaps even more telling, ad sales people had little training for digital. Or in reality, little training for sales at all — many were holdovers from the days when the skillset basically involved picking up the phone and taking advertisers’ orders with little initiative required. By the 1990s, most U.S. newspapers were monopolies in their local markets with profit margins of up to 40 percent. It’s only natural that when Internet competition arrived in the form of Craigslist and Monster.com, advertisers quickly shifted their business to less expensive, more responsive options. Resistance to change is not uncommon across industries and occurs for a whole host of reasons, especially when change is threatening to people’s professional identities or feelings of competence. We aren’t saying there are any easy villains here by any means. It’s not the personal failing of a handful of curmudgeons failing to see the light but the complex interplay of organizational and psychological factors that inhibit the ability to adjust routines to new technologies and rhythms. Our data and conclusions support Buttry’s contention that you can’t call “digital first” a failed strategy if it was a strategy that was hardly applied in a meaningful way as the industry ventured onto the Internet. These days, progress is finally being made, but in many cases, it may be too late. As Chyi and Tenenboim point out, habits have been formed, and people are used to going to aggregators for news, which has become a plentiful commodity. Now is the time to dispense with the hand-wringing. More than ever, print versus digital is the wrong way to frame the discussion moving forward. It isn’t about the platform; it’s about focusing on the audience and their needs, thinking about ways to build collaborative spaces, where journalists and the public work together in creative ways to report on their local communities. This report and Shafer’s cheerleading on its behalf threatens to re-open a relatively settled cultural conflict in newspapers that could de-rail serious, credible attempts to fashion a sustainable future for local newspapers and the in-depth journalism they produce. It’s not helpful during a time of severe stress in the industry, even severe by the standards of the last decade. We also disagree that print is a superior format for news. Yes, it has that tangible quality to it that makes it feel more reasonable to pay for it, but you can’t interact with it, it doesn’t allow for multimedia formats, you can’t link to broader context, and it isn’t nearly as good at giving you what you want when you want it. However, Chyi and Tenenboim are right that most local daily websites are a usability disaster. They are slow to load, chock full of distracting ads, hard to read, and lacking in mobile optimization. Staff sizes have been cut to the bone even as the demand for more content has grown, and the race for clicks has produced a lot of thin, fluffy content. So, yes, it’s no wonder that people are leaving print but not becoming digital subscribers. But again, that is a signed of a failed execution of digital rather than a failure of the Web as a medium for news. People pay for what they value and trust, and that bond between news organization and the community it covers has been broken in many markets. What should newspapers have done, and what should they do now? Better understand and serve your digital audience. Instead of chasing page views, build relationships and loyalty. Engage readers, and help them participate in news in meaningful ways. Build with, not for. Make the important news more relevant and accessible. Explore diverse revenue streams, such as events and membership. Pay attention to what other scholars have found makes for stickier news. And for God’s sake, stop pining for the days when newspapers had monopolies in their markets and could virtually print money with their presses. Those days are long gone. August 8, 2016 October 23, 2016 GrovesComments are off for this post. A little over a decade ago, I left the newspaper business. I had spent 14 years of my career in a variety of newsrooms. I had experienced life at a family-owned newspaper as well as corporate-controlled outlets under Gannett and other chains. By 2005, the push toward online had taken over as news organizations struggled to figure out how to reach audiences and make money. Even then, I could see the toll it was beginning to take on our journalists. It became more and more difficult for beat reporters to delve into investigations. We were pushing them for more frequent updates and shorter stories. I worried what the future might hold. In 2006, I became a doctoral fellow at the Reynolds Journalism Institute at the University of Missouri at Columbia and began researching ways to save newspapers. By 2008, my research agenda had changed — to ways to save journalism. It wasn’t about the medium; it was about the connection between information and community. With the rise of SEO and social media, we were at risk of losing robust reporting, especially at the local and regional levels. Fast forward 10 years to the rise of Trump, the unlikeliest presidential nominee of our time who is pushing people such as The New York Times’ Jim Rutenberg to ask: What is the role of journalism in today’s society? Do we remain “neutral” observers — what some would argue is the stenographic fallacy of misunderstood objectivity? Or are we in an environment that demands something more from us as journalists? Brian Stelter, former media columnist for The New York Times and current host of CNN’s “Reliable Sources,” attacked the confused conceptions of balance and fairness when faced with a candidate who regularly ignores the truth. Interviewers — even the ones that support the person they’re interviewing — have an obligation to probe further and push back when a candidate says something dangerous, and this is dangerous. Suggesting an election is going to be stolen? This is third-world dictatorship stuff. Bill Kovach and Tom Rosenstiel, in their seminal book The Elements of Journalism, warned against contorted notions of objectivity. In the American model of journalism, objectivity should be focused on the method of news gathering, not the news gatherers. In other words, journalists should act like social scientists, vigorously testing and verifying information. They should be transparent with their data, and detail their news-gathering methods and sources. And they should not set up some false sense of “fairness” when people wrongly challenge well-established facts as beliefs. It is a model under fire because journalists today rarely have as much time and resources to delve deeply into issues of import. And with so much emphasis these days on immediacy over accuracy, too many live interviews go unchecked or unchallenged. Too much time is spent on what might garner clicks than what might effect change. Leave it to none other than John Oliver, host of HBO’s “Last Week Tonight With John Oliver,” to capture the essence of the state of journalism today. And the truth is, a big part of the blame for this industry’s dire straits is on us and our unwillingness to pay for the work journalists produce. We’ve just grown accustomed to getting our news for free. And the longer that we get something for free, the less willing we are to pay for it. … Sooner or later, we are either going to have to pay for journalism, or we are all going to pay for it. Innovation: How much freedom is too much? June 4, 2016 June 6, 2016 GrovesComments are off for this post. It’s a constant conversation among clients and colleagues: How big-sky should your thinking be when it comes to innovation? As a creative person, I am a fan of the open canvas in many settings to avoid the shackles of legacy thinking. Analyze a particular problem, and brainstorm solutions regardless of limitations. Work to develop an innovative answer, and then figure out how to implement the idea within the resources of the organization. But there is an inherent weakness to this approach. It often fails the reality test. Cautious colleagues may raise resource obstacles to avoid implementing any version of the innovation. Others may use the culturally based “well, that’s not who we are” rebuttal (and its ostrich cousin, “we already do that”) to derail the outside-the-box solution. In classroom settings, I’ve found that many students — graduate and undergraduate — recoil at the thought of a boundless assignment in which they develop the framework. An alternate approach is to start with a strategic exercise such as a SWOT (strengths, weaknesses, opportunities, threats) analysis to identify organizational constraints before brainstorming. By putting borders on the creative canvas, it controls the chaos and inspires focused solutions. The thing about eight-track was it was punch in and go. And it was a perfect format for the Stones. You walk into that studio and you know where the drums are going to be and what they sound like. Soon after that, there were sixteen and then twenty-four tracks, and everyone was scrambling around these huge desks. It made it much more difficult to make records. The canvas becomes enormous, and it becomes much harder to focus. At the time, the band was touring incessantly. They had three days of recording time at the famous studio in Muscle Shoals, Ala., and with the focus inspired that tight span, they recorded “Brown Sugar” and “Wild Horses,” two classics of the band’s canon. What have you found in your experience? Do you find unbridled brainstorming generates the best solutions? Or do constraints inspire the most effective answers? March 9, 2016 August 8, 2016 BrownComments are off for this post. There are some key lessons for news leaders in the “What Google Learned from Its Quest To Build the Perfect Team” piece in The New York Times Magazine that remained on the “most-emailed” and“most popular on Facebook” lists for over a week; many of them match up with what we have learned in our research on newsroom culture and change. We all hate meetings and awkward workplace interactions — try assigning group work to students, and you’ll hear all of the groans in the room — but like it or not, the modern workplace is one in which collaboration is increasingly necessary. As my CUNY-J colleague Jeff Jarvis would say, it’s never a terrible idea to ask, “What would Google do?” And even if you are skeptical of this tech behemoth, its massive budget and ability to parse data means that more often than not it can find a way to get things right. Not surprisingly to us, Google found that it’s not who is in a group that matters so much as the group norms — and the sense of psychological safety or lack thereof that the group fosters for its members — that determines its effectiveness. ‘‘We had lots of data, but there was nothing showing that a mix of specific personality types or skills or backgrounds made any difference,” Abeer Dubey, a manager in Google’s People Analytics division, told the NYT. What are group norms? The story articulates the common definition: “the traditions, behavioral standards and unwritten rules that govern how we function when we gather.” Often, these rules are informal and haven’t even been formally articulated until asked. So what kinds of group norms are best? Here again, the Google researchers found a mixed bag; there was not one right answer. (They) eventually concluded that what distinguished the ‘’good’’ teams from the dysfunctional groups was how teammates treated one another. The right norms, in other words, could raise a group’s collective intelligence, whereas the wrong norms could hobble a team, even if, individually, all the members were exceptionally bright. These group norms become even more important when an organization is facing tumultuous change, and people are already anxious about job security and new responsibilities. People can easily become paralyzed and distracted at work when they are worried about their careers. Often, newsroom leaders think “the answer” to dealing with digital transformation is all about finding the right people and marginalizing or getting rid of the curmudgeons. Sometimes this is necessary, but we have found that interviews with even the most recalcitrant often led to some great ideas if people felt like they being heard and not being summarily dismissed if they raised a concern. Google’s own research found that good teams allowed everyone to speak equally, and had high “average social sensitivity” or the ability to understand what each other were feeling, often based on nonverbal cues. But creating this kind of safety in teams isn’t something you can just order people to do. One technique Google employees found was effective was sharing personal stories, even about the kinds of intimate things people don’t normally find appropriate to speak about at work. In times of change like those news organizations face, people have an even stronger need to build trust with co-workers, and the proverbial “outside-the-box” ideas that may seem silly at first may be especially valuable. What Project Aristotle has taught people within Google is that no one wants to put on a ‘‘work face’’ when they get to the office. No one wants to leave part of their personality and inner life at home. But to be fully present at work, to feel ‘‘psychologically safe,’’ we must know that we can be free enough, sometimes, to share the things that scare us without fear of recriminations. February 21, 2016 February 21, 2016 GrovesComments are off for this post. Google and Facebook recognize it: Ephemeral content wears thin. If their algorithms continue to surface popular but ultimately meaningless content, people will slowly realize those online spaces, too, add little to their lives. Audiences will eventually gravitate to other places that offer more meaning and fulfillment, where they can find deep, rich content. Think about how users moved away from Farmville and other casual games once the novelty wore off. Smart media organizations have recognized the importance of distinctive high-quality content for inspiring audience connections, and they have begun investing heavily in meaningful productions. Netflix’s “Jessica Jones” and Amazon’s “The Man in the High Castle” have followed the lead of HBO, AMC, and other channels to produce long-form, binge-worthy content for audiences craving deep characters and sprawling narratives. But it’s not all fictional franchises. ESPN reinforced its credibility with “30 for 30,” a series of well-recognized sports documentaries now in its third iteration. Those documentaries spread through Netflix and continue to be shared on Facebook, Reddit, and other social-media platforms because of their attention to detail and commitment to storytelling. As the online-analytics discussion has turned toward engagement over the past few years, I’ve been thinking more about content longevity in a news context. How can we make our offerings the kind of content that people binge upon, return to, and reference time and again? Just recently, I discovered the perfect example: The New York Times’ Cooking site. The Times already has me hooked. I pay for the digital edition and trust its NYT Now app for regular news updates. But I hadn’t used its Cooking site much — until I was preparing for Super Bowl Sunday. Like many Americans, I was planning on making chicken wings as an appetizer. When I checked the news on the Times front page that morning, there was a link to Super Bowl recipes on its Cooking site. I clicked on the Buffalo chicken wings recipe from Mark Bittman and immediately saved it to my Pinterest account, where I store recipes and reference items. I then noticed the Times also allows you to save the item in your own recipe box at its site. It’s a brilliant move to offer social-media options in addition to the recipe box; in this case, I created a box and ended up saving it in both spaces. In fact, the Cooking site’s intuitive and easy-to-use interface is designed much like Pinterest. You can save recipes in a customizable recipe box and explore the site visually, according to your needs. In this flurry of recipe exploration, I also discovered an article link within the cooking site to a longer piece titled “The Key to a Truly Great Chicken Wing.” I read the entire piece — I have since converted to grilling chicken wings — and then saved that article, too, to my Pinterest. It was then I realized the article was from August 28, 2013. Here we have a 2½-year-old article being read, shared, and saved in 2016. I spent more than 15 minutes among various Times pages exploring content deeply. And here I am, days later, writing about it and sharing it again. Part of the reason for that: I didn’t experience the sense of clickbait regret that comes when I’ve been seduced by a vague headline. It was meaningful content that was well-written, passionate, and educational. It was relevant to my life. It was worth the click. Granted, a wing recipe is not news per se. But it’s content that goes beyond a frivolous Vine that elicits a giggle. And it’s a piece I will return to time and again, especially when I want to recommend chicken-wing tips to a friend or family member. Other organizations are applying such techniques to more traditional news as well. Vox has experimented with a recipe box of sorts for news with its embeddable card stacks. These regularly updated content items offer easy-to-navigate stacks to review today’s major news topics. Within each stack are Q&A explanations that include myriad links to older Vox posts on the topic. When I’ve brought up the idea of longevity to journalist friends of mine, they say they’ve been doing such articles for years; it’s the evergreen story of old. To me, those stories smack of clickbait — quickly rehashed tales and how-tos meant to capitalize on a holiday, event or anniversary with little thought about the audience’s needs or desires. True engagement emanates from the audience first. How do we as media organizations fit into their lives? And how can we fulfill their needs in a way that’s meaningful and relevant to them? December 2, 2015 February 21, 2016 GrovesComments are off for this post. As an editor and newsroom manager, I had been drawn to Michael Porter’s ideas of strategy, especially his 2001 essay “Strategy and the Internet.” Too often, I had watched my organization and others slash and trim to improve their bottom lines for short-term gains. Porter’s call for strategic positioning over operational effectiveness made more sense: Don’t sacrifice long-term advantage for ephemeral successes meant to appease the stock market. It was a compelling idea that lingered with me as I pursued my doctorate and moved into research. As I worked my way through the program, I sifted through a number of ideas, hoping to find some frameworks and guides to help the news industry transition successfully to the world of the Web without sacrificing its long-term viability. Then, Clayton Christensen disrupted my thinking. Porter focused on the competitive environment at the industry level. Christensen’s research on innovation — most clearly articulated in his book “The Innovator’s Solution” with Michael Raynor — built on Porter’s work and put the focus in a news context squarely on the audience. Christensen offered tangible advice for thinking meaningfully at the audience level. Don’t ask the audience directly what it wants; they often don’t know consciously. Instead, think in terms of jobs to be done. Through observation and contemplation, consider what audience members are “hiring” your content to do. Too often, businesses overshoot consumer needs. Companies and their structures typically reward sustaining strategy, safer development supported by market research and proven products. They stick with what they’ve always done and applaud improving their best products. The problem: They often end up overshooting consumer needs. Into this environment comes disruption from new or lower-end products that fulfill jobs more in line with audience expectations. And by the time incumbents realize their flawed perspective, it is too late to recover. When the functionality and reliability of products overshoot customer needs, then convenience, customization, and low prices become what are not good enough. Well before their legacy counterparts, new sites embraced and experimented with aggregation and online story forms. Craigslist and Monster.com understood more quickly how to deliver cheaper, customized classifieds. And social media developed more convenient mechanisms for content discovery and sharing. To survive in this environment, news organizations must become as experimental and nimble as the upstarts. They no longer have the luxury of lengthy content testing; they must push nascent products into the marketplace and iterate while learning from the audience. With this framework, they can identify and fulfill the communication jobs to be done. Historically, mass-communication researchers have concentrated on the impact mass media have on the audience. In the Internet age, however, the power has shifted to the audience, as Jay Rosen, Clay Shirky, and other media scholars have noted. As the traditional mass media weaken, the uses-and-gratifications thread of media research offers a more useful framework for uncovering the audience’s jobs to be done. Tapping into the long line of uses-and-gratifications research (as media scholars Esther Thorson and Margaret Duffy did with their Media Choice Model), we can focus on the primary communication needs — the “jobs” in Christensen’s parlance — that users want to satisfy: information, entertainment, connectivity, and consumption (shopping). In addition to the detailed insights offered by individual models, it’s healthy to remember that users are selfish, lazy, and ruthless in applying their cost-benefit analyses. As we develop the next generation of news content, we must embrace the audience and its needs. Such a focus doesn’t mean we should shamelessly cater to all audience wants and desires. It just means we must consider the audience and the contexts of media consumption more completely as we develop our content, whatever form it may take. Otherwise, our audience will selfishly, ruthlessly go elsewhere. Note: This post originally appeared as a response to the Carnival of Journalism project, where people passionate about journalism are sharing ideas in the blogosphere about ways to preserve and improve the craft. November 25, 2015 February 21, 2016 BrownComments are off for this post. As someone who has been studying organizational change in newsrooms for many years, I think the recent American Press Institute report on a culture-based strategy for innovation in newsrooms is well worth a look. I especially liked the way it described newsroom structure as one of “tribes.” Human beings naturally organize into groups based on their role in an organization and/or their level of experience, congregating closely with others we feel most comfortable with or need access to, the report says. In newsrooms, sports reporters and the copy desk are just a couple of examples of tribes. Tribes are tremendously influential on organizational behavior because people act in accordance with others around them, and they can make or break attempts at change, the report says. This jibes with the academic literature on leadership and culture as well as the newsrooms Groves and I have observed and studied, and I think it also describes the phenomena in a way that is easy to grasp and therefore act on. Although newsrooms are notoriously hierarchical, I’ve also long felt that they differ from the kinds of average corporate environments described in much of the academic work on culture. Top leaders are important in newsrooms, of course, but a) most journalists tend to have an aversion to power, which is, after all, to some extent part of their job description and b) journalists have an abstract sensibility that the real leader is “the public,” and can often find ways to defend the status quo on that basis. This leads to different dynamics in terms of how people respond to directives. Thinking about tribes as a key influence on what kinds of change people accept helps make it clear how leaders’ priorities can be undermined, even assuming that these priorities are communicated clearly and rewarded, which often is not the case. Shameless plug: The API companion report on best practices for innovation in news organizations, by Craig Silverman, mentions our model for change, which encompasses culture, innovation, and strategy. May 30, 2015 June 3, 2015 GrovesComments are off for this post. I’m one of those journalistic idealists enamored of the promise of Vox Media and Re/code. When Vox’s acquisition of Re/code was announced this past week, I focused on the strategic aspects in terms of content and competencies. What do you think about all the VC money Vox has taken? I’m a little torn about how much money these sites are getting. It’s great — but what does it mean for the long haul? She pointed me to a Fortune piece by Mathew Ingram that raises valid questions of the journalist-as-brand myth. Can big-name journalists such as Walt Mossberg and Kara Swisher really make it on their own, without the big media backing? Or, as Brown pointed out, without the VC funding? Years ago, as a business reporter in Arkansas, I wrote a series of stories about the possible acquisition of one of the state’s largest bank-holding companies. The stock price had begun moving, and the company had issued a boilerplate press release that noted the possibility of selling. As I wrote analysis pieces about the strategic implications of a sale, the CEO reminded me of his primary imperative: to maximize shareholder value. 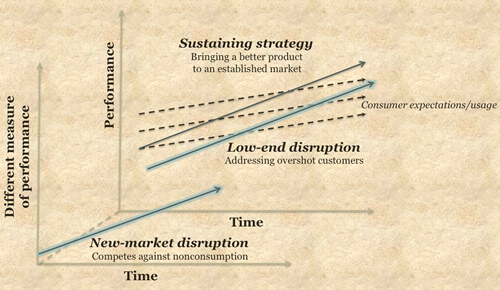 When I analyze company strategies, I extend that question out: Are you trying to maximize value over the long term? I’m driven by Michael Porter’s distinction between operational effectiveness (trimming costs and running an efficient organization) and strategic positioning (providing a unique product/service in the marketplace that differentiates your organization). Pixar ran at a loss for years before figuring out a business model that worked. People scratched their heads initially at Google’s $1.65 billion purchase of YouTube, wondering how it would turn that asset into something profitable. Amazon had its bumps before becoming the Web’s department store. But in each case, key executives believed in the quality of the idea and invested the time and resources to develop the competencies to make their companies profitable. In the case of publicly traded companies, it’s tempting — and demanded in many corners — to focus on the quarterly results, on that short-term stock-price gain. But consistent cuts and layoffs that may appease the markets can have disastrous long-term implications at the levels of culture and innovation. Employees become frustrated, and burnout rises. They become skeptical of the Next Big Initiative (e.g. Gannett’s regular cycle of re-creating its newsrooms with new configurations and job titles), especially when people are consistently asked to do more with less. And they are less willing to take risks — especially ones that don’t guarantee a large return on investment. For innovation to thrive, it requires investing in research and development, and accepting a certain degree of risk. The challenge for media companies — especially the threatened mid-sized ones Ingram highlights — is that there often isn’t enough left for substantial investment in risky new ideas. May 27, 2015 May 28, 2015 GrovesComments are off for this post. Innovation may be the buzzword that won’t die, but Vox Media has not forgotten a keyword for success: strategy. Since its founding in 2011, Vox has made several smart strategic decisions as it has developed and expanded its media presence. Yes, it is an innovative company, but its leaders have developed a keen sense of self to provide a well-defined vision for what they want Vox to be. We believe that brands matter. Over the years, the company has developed topical sites — such as SBNation, The Verge, and Eater — that focus on their niches with authority and authenticity to build communities around their content. Bankoff noted in his address that Vox Media has concentrated on hiring top talent and developing a content platform that allows its creators to understand and connect with their audiences. What is our organization’s long-term vision? What is our distinctive spot in the marketplace? How do we most effectively use our resources to maximize success? In this context, the purchase of Re/code announced Tuesday night makes complete strategic sense for Vox. Enter Re/code, which brings Walt Mossberg, Kara Swisher, and a Wall Street Journal lineage to Vox’s stable of established brands. It’s not just about the type of content, however. Re/code has established itself with its industry events that draw big names, big audiences, and big dollars. It’s an area that Vox has yet to develop fully; with this purchase, it gains that expertise from an established brand immediately. In exchange, Re/code gains Vox’s valuable Chorus content-management system to improve the performance of its well-respected content. It’s as good a strategic fit as you could ask for, one that aligns well with Vox’s long-term strategy of building media communities around brands. The key question will be whether those cultures can merge effectively without too much of a clash. January 16, 2015 January 16, 2015 GrovesComments are off for this post. Look at BuzzFeed at any given time of day, and you’ll see a host of enticing quizzes and timely listicles like the clickbait below. Who can resist such easy-to-digest content? Not many of us, apparently. (I am Thing One, by the way.) BuzzFeed is now among the top 10 U.S. sites for traffic, and news organizations have been adopting similar content strategies to improve their daily numbers and bolster ad revenue. In our research, we’ve studied how the Christian Science Monitor incorporated such items into its content mix to grow its traffic tenfold. Even former NYT editor Bill Keller acknowledged the lure of listicles in a recent interview. But, as appealing as multimillion-visitor traffic is, it is ephemeral. In today’s environment, such quick-hit success doesn’t necessarily translate into long-term engaged audiences, the ones that advertisers and content producers so dearly desire. The clickbait audiences are selfish and distracted, eager to find the next flashy app or sweet click-candy to share with their own social-media networks. They are fickle and easy to lose. Just ask Zynga, purveyor of the once-ubiquitous FarmVille and Words With Friends. So it is that the conversation has returned to long-form content and the value of original investigative reporting. BuzzFeed itself touts a news section and a column of headlines on its front page; its banner today focused on Secretary of State John Kerry in France. And its investigative unit recently celebrated its first year of operation, with several high-profile investigations under its belt. As thrilling and fulfilling as this year has been, it is, of course, just the beginning. The stories that you have planned for the upcoming year are even better. They have the potential to root out horrific harm to defenseless people and to expose corruption on a global scale. As one of my mentors, Paul Steiger, would say, these are stories with moral force. “… root out horrific harm to defenseless people … expose corruption on a global scale …” Those remind me of the reportorial adage, “Comfort the afflicted; afflict the comfortable.” It seems investigative journalism hasn’t lost its luster, even in the digital age. Politico, known for its feverish 24-7 coverage of national politics, lured media critic Jack Shafer to its offices after hiring Michael Grunwald and Michael Crowley of Time. The apparent goal: a push toward deeper, more analytical coverage. Upworthy recently hired Amy O’Leary, former deputy editor of digital operations at The New York Times, as its editorial director. The good news for traditional news outlets? Most already have such journalistic talent in-house, if they only choose to nurture and capitalize upon that strength. Too many organizations are leaping into clickbait strategies at the expense of traditional journalism; instead, they should be used to complement that harder-to-produce, more valuable content. Investigative journalism can have long-tail value and keep audiences coming back over the long term. But leaders and managers have to have the patience for that audience to build slowly and meaningfully over time. Perhaps when crafting our strategies, we should channel a little more Lorax, and a little less Cat in the Hat.